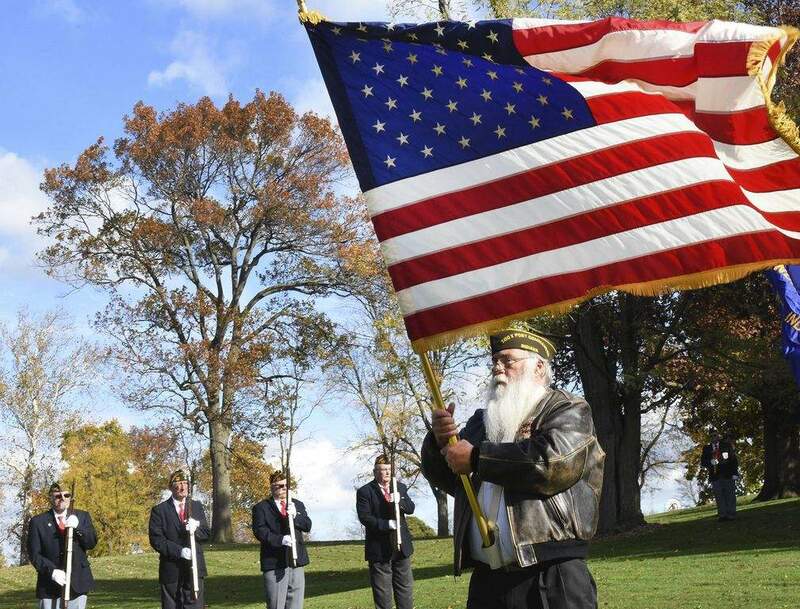 FILE: Veteran Alva Waggoner retires the colors during an annual Veterans Day remembrance ceremony at Memorial Park. The Fort Wayne Parks Board on Thursday approved plans calling for $700,000 in upgrades to Memorial Park. The recommendations were included in a report from a task force charged with examining possible improvements to the park. The report was first reviewed by board members in August. Suggestions include landscaping upgrades, new pathways and refurbishing neglected statues and memorials. Two memorials – one to Vietnam veterans and one to the baseball team Fort Wayne Daisies – will be moved to other locations in the park, according to the report. Funding is in place for some of the projects, but officials will later consider paying for others. “We're not asking the board to approve all the expenditures,” said Alec Johnson, Fort Wayne Parks and Recreation Department deputy director of planning and development. The task force was formed in June 2017 after a plan from Indiana Tech to develop the park drew opposition from veterans groups and residents nearby. That plan called for a new athletic facility, improving an existing softball field and moving some memorials. The report recommends spending $104,600 on paths 6- to 8-feet wide to connect attractions in the park and the surrounding neighborhood. Projects among top priorities listed in the report include spending more than $42,000 to refurbish the Olen J. Pond Memorial and paying up to $88,400 on improvements to the Arthur Smith Memorial. Board President Rick Samek said last month maintenance funds could be used to pay for some of the projects. The report says the department has budgeted $50,000 through 2022 for monument restoration. The parks department has earmarked $50,000 per year through 2021 for park improvements related to task force suggestions, according to the report. In other business, the board approved spending $75,520 to create a master plan for Franke Park. The department will pay architectural and planning firm Ratio Architects to outline possibilities for the park's future. Samek said the plan will focus on infrastructure. The plan is expected to be completed in April.